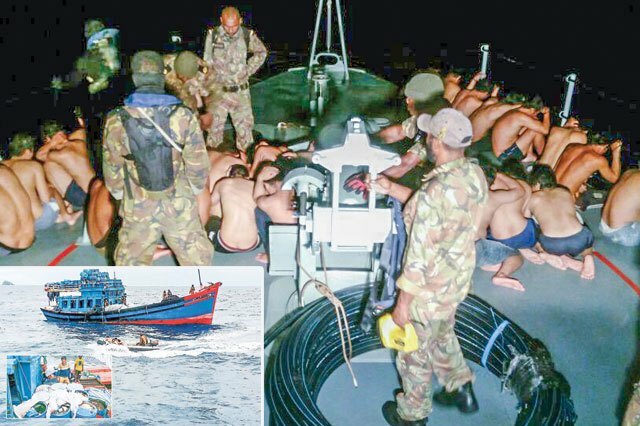 THE PNG Navy intercepted three foreign fishing vessels in Milne Bay last week and confiscated 77 drums containing sea cucumbers, according to a Defence Force statement. Defence Force Chief of Staff Colonel Ray Numa thanked the Australian Maritime Border Command and the crew of the naval ship HMPNGS Seadler for the successful operation. The operation (OPS XMAS 2016) was conducted by the navy last weekend. The 50 foreign sailors had been illegally fishing near Budibidi Island in Milne Bay. The navy sent HPNGS Seadler from Port Moresby on Dec 20 arriving on Dec 22 at Budibudi Island, about eight nautical miles west of Alotau. With the help of the Australian Maritime Border Command, the three Vietnamese fishing vessels were spotted on radar in the area. The crew of two of the fishing boats cooperated with the PNG Navy. The third tried to resist but also gave in. The 77 drums containing sea cucumbers were found after a search on board the vessels.